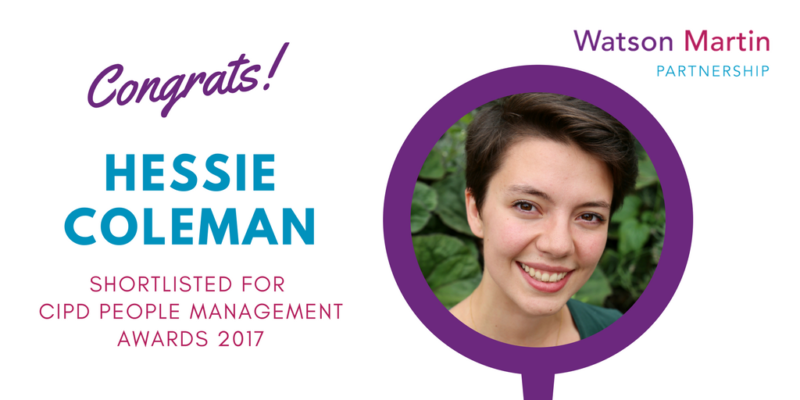 Hessie Coleman, a Watson Martin Partnership candidate, has been shortlisted for the Michael Kelly Outstanding Student Award, one of the prestigious CIPD People Management Awards 2017. Hessie Coleman, one of seven to be shortlisted for the advanced level award, is Head of People Operations at Starling Bank – the mobile-only next generation UK Bank. The winner of the award will be announced at a celebration dinner at Grosvenor House, Park Lane, London on Tuesday 26th September. Hessie, who is half way through her CIPD Advanced Diploma in HR Management with Watson Martin Partnership, is a strong contender for the award with her entry on creating an innovative customer service centre for Starling Bank. The high-tech start-up UK bank strives to connect banking and technology through its mobile-only current account, aiming to give customers clarity and control over their money. Customers can manage their money entirely through the Starling banking app which is connected to 24/7/365 support – the customer service team is at the heart of the business. Hessie’s entry details her creation of Passport to Starling, a scheme enabling customer service agents to be seconded to other areas of the bank’s business. The scheme works on a rotational basis to improve their engagement and minimise traditional issues associated with call centres such as high absence and attrition. “Customer service is very important to us and we didn’t want our team to be tucked away in a support centre far away from the business, but for people to be enjoying good and interesting careers,” Hessie explains. “Passport to Starling keeps engagement in the customer service team very high while at the same time growing and developing our people depending on business need and their skillsets, aspirations and experiences. “It has been very successful. We are investing in people who are really engaged and so highly loyal while at the same time avoiding the cost of recruitment by seconding internally to cover short-term resource demand. We have recently extended our secondments to other areas of the business and now have everything from software engineering to marketing job swaps,” she adds. Hessie has used much of the knowledge gained in studying for her CIPD Advanced level qualification to design the basis of the Passport to Starling scheme. Specific aspects include: motivational theories from the Performance Management module to boost job satisfaction and research from Leading, Managing, Developing People to build employee development into the job design for the customer service team. Watson Martin Partnership personal adviser Stan Booth has also proved invaluable in guiding Hessie through the Advance Diploma and advising on the modules to pick which complement her current work responsibilities. Having already achieved a distinction in her first exam along with a couple of merits for the modules she has taken so far, her WMP adviser believes she has every chance of success in the Michael Kelly Award. Well done to Hessie and we wish her every success in the final of the award next month.